Prime Minister Sheikh Hasina on Monday asked policemen to be people-friendly while discharging their crucial role as protectors of law, reports BSS. “You’ll have to build yourselves as more people-friendly keeping in mind that you are members of police force of an independent country,” she said. The premier made the directive while addressing the inauguration of the Police Week at Rajarbagh Police Lines in the capital. “I hope that each and every member of the police force will extend their helping hand to the helpless,” she said. The prime minister also asked policemen to properly discharge their duty as the protectors of law. Sheikh Hasina reminded police personnel that they would be rewarded for their success but they must ensure their accountability for everything they do. The main law enforcement agency this year observes the Police Week-2018 with its motto being “Remedy of Drugs and Militancy: Commitment of Bangladesh Police”. On her arrival at the venue, the premier was received by Home Minister Asaduzzaman Khan, Inspector General of Police (IGP) AKM Shahidul Haque and Home Secretary Mostafa Kamal Uddin. Different police contingents staged a spectacular parade led by superintendent of police (SP) Mohsin Hossain to mark the police week and riding on an open jeep the Prime Minister visited the parade and took salute. Cabinet members, parliament members, senior government officials witnessed the ceremony. The Prime Minister handed over police awards in four categories to 182 policemen including officers for their outstanding performance in 2017. Three of the awardees were posthumously honoured with the BPM (bravery) Award as they laid down their lives during the anti-militant security clampdown at the terrorist den at Atiya Mohal in Sylhet last year. They are Lieutenant Colonel Azad, who was serving in elite police unit RAB on deputation, Inspector Monirul and Inspector Koysor who laid their lives during a security clampdown at a militants’ den at Atiya Mohal in Sylhet. The premier said stable law and order was a pre-requisite for the country’s development and her government considered allocations made for that purpose as an investment, not expenditure. “That’s why we’ve kept up the trend of overall development of police in full extent during our present tenure,” she said. The premier reminded policemen of the importance of accountability and expected the “IGP Complain Cell” set up at the Police Headquarters could play an effective role in making them more accountable. Mentioning that stable law and order situation is a pre-requisite for the country’s development, the prime minister said the government considers the money allocated for the law and order as an investment, not expenditure. “That’s why we’ve keep keep up the trend of overall development of police in full extent during our present tenure,” she said. The prime minister said to build a secured peaceful country, her government has been implementing a massive work plan for raising overall capability of the police by strengthening its infrastructure and human resources management. She said her government has already implemented most of the pledges it made for the modernization of Bangladesh Police. Sheikh Hasina said assuming office in 2009 her government created 32,031 posts in the police organogram and “in 2014, we took a decision for creating 50,000 more posts and against it, nearly 44,000 have already been created”. The government, she said, has a plan to raise further the manpower of the police. Sheikh Hasina said raising further the facilities of housing, ration and healthcare, providing training and supplying of necessary vehicles and other equipment were in the government’s active consideration. She said her government constituted special police units like the Police Bureau of Investigation, Tourist Police, River Police, Industrial Police, two special security and protection battalions, female armed police battalion and 12 armed police battalions. 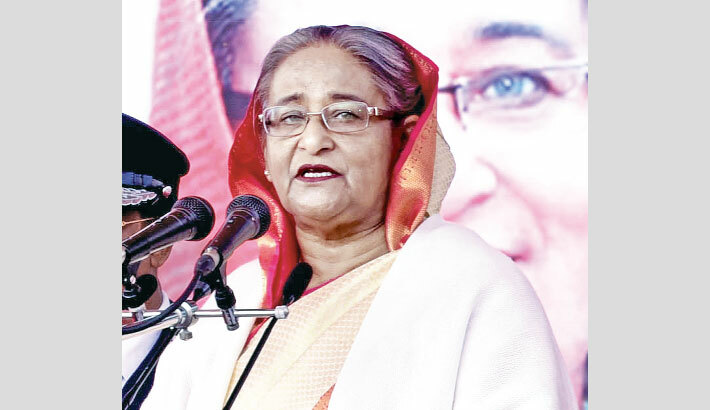 “Initiatives have been taken for specialized Guard and Protection Police unit for further strengthening the security of important establishments and persons,” Sheikh Hasina said. The premier described police force as a symbol of peace, security and order saying policemen were performing their duty in all crises with courage while they earned the countrymen’s appreciation for their sincerity, competence and professionalism. She recalled that 21 policemen sacrificed their lives while facing the BNP-Jamaat sponsored violence, sabotage and arson attacks to kill innocent people and destroy the state property. The prime minister said Bangladesh Police also earned repute abroad as well due to their performance in UN Peacekeeping Missions with utmost efficiency and professionalism. But she feared militancy and terrorism to be the biggest threat to the country’s peace, stability and development and reminded policemen a terrorist has no religion, caste and creed. “We condemn any violence in the name of religion,” she said. Sheikh Hasina said the soil of the country was achieved in exchange for blood of millions and so “there will be no room for militants, terrorists and war criminals on the soil of the country”. Referring to the successful government initiatives in controlling militancy and terrorism she said apart from the security clampdowns “we’ve involved family, women, youths, mass media and religious leaders to check spread of militancy and terrorism”. The prime minister said the Police Anti-terrorism Unit was constituted to raise capability of the police in stamping out militancy and terrorism. “We expect that the new unit will continue to play an effective role in rooting out the social menaces and expose their patrons to justice,” she said. Pointing out the influx of lakhs of Rohingya people into Bangladesh, she said Bangladesh Police with the coordination of the country’s other organisations was playing praiseworthy role in providing shelters and security to the huge number of displaced Myanmar citizens.